Keg CheckWhen In Doubt, Whip It Out! The Keg Check is a unique tool that allows you to check the amount of draft beer in a keg quickly and efficiently. * No special skills or strength required. * No complex moving parts. * Can be used to take inventories on 13.2 gallon (50 liter) and 15.5 gallon (half-barrel) kegs. 1. Hook the Keg Check onto the edge of the keg as shown in the diagram. 2. Slowly pull the handle horizontally (as illustrated) towards you until the far side of the keg is clear of the ground. Gently ease the keg back down and before it actually touches the floor, the contents will be shown by the pointer on the scale. Click on this link to download a PDF version of the Keg Check Instructions. How accurate is the Keg Check? The Keg Check scale is marked off in 1-gallon increments. When you look at any given measurement the pointer will be either directly on a line (ie: 8 gallons like in diagram (a) below) or the pointer will be between lines (ie: 3� gallons like in diagram (b) below). Now for the math. Since we can measure to a full or half gallon, and there are 8 pints or 128 ounces in a gallon, we can see the Keg Check is measuring to within 4 pints or 64 ounces, roughly a pitcher of beer. How does the Keg Check account for the weight of the Keg when measuring gallons inside? Don't you also need the weight of the empty keg as well to determine how much beer is in there? 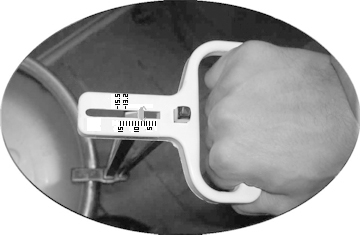 The Keg Check works on a "torque-wrench" principle - the heavier the keg (more beer) means the more effort or 'force' is needed to tilt the keg off the floor using the leverage of the Keg Check. 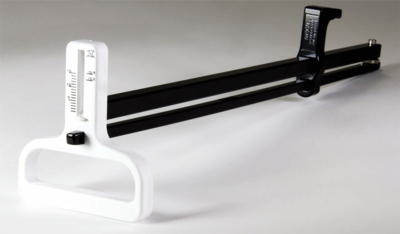 The scale on the handle can be calibrated to measure either a standard 13.2 gallon keg or a 15.5 gallon keg. The graduations are set from 0 to 15.5 gallons and Keg Check is calibrated based on '0' being the empty weight of a typical keg and 15.5 being the weight of a full keg. Can the Keg Check be used on 5 gallon kegs? The Keg Check is designed to clip on to standard 13.2 and 15.5 gallon kegs. Even though 5 gallon kegs, and other smaller sized kegs may have a similar lip that Keg Check can clip on to, Keg Check cannot be accurately calibrated to work with these. The only larger keg we've had a problem with is the rubberized one since Keg Check won't clip onto the smooth lip of the keg. Does the keg have to be lifted off the ground completely? No! This is one of the big advantages Keg Check has over other weighing scales that measure draft beer. You do not lift the keg vertically off the ground - instead you use the Keg Check's unique design to tilt the keg. Considering a 15.5 gallon keg is about 160 pounds, this is much easier on your back! SPECIAL BONUS: For only $20, you can add our Excel-based Keg Check Software that will help you quickly crunch your draft beer inventory figures. The software will calculate draft usage costs, inventory values, potential draft sales, cash register shortages and your operation's draft beer cost percentage. For a limited time, order the Keg Check Software and you will not only receive Draft Inventory Software but we will also include an Excel-based Bottled Beer Inventory Software at no charge!